I listened to the end of an interview today with Gretchen Rubin. She wrote a book called Better Than Before: Mastering the Habits of Our Everyday Lives. What caught my attention was the phrase "better than before". As I listened it was clear she became a happier person by focusing on what she wanted to make her feel better and happier. As she identified what she wanted to experience she decided to do something about it. Since it involved change it required her to do things differently. she used her will to create a new habit that supported that desire. Over time the habit became a part of her everyday life. happier about herself and her life. What she described is what I am experiencing in my own life. Three years ago I started making one decision at a time. I kept working at it everyday until it became a habit. When it became a part of my daily life...my way of being... I felt better. That made it easier to find something else I wanted to change. The old me would decide to change everything all at once. Of course that never worked. I ended up frustrated, angry and paralyzed. I became happier and healthier. What one thing would make you feel better now? Decide to do whatever you can to support yourself in accomplishing that one thing. 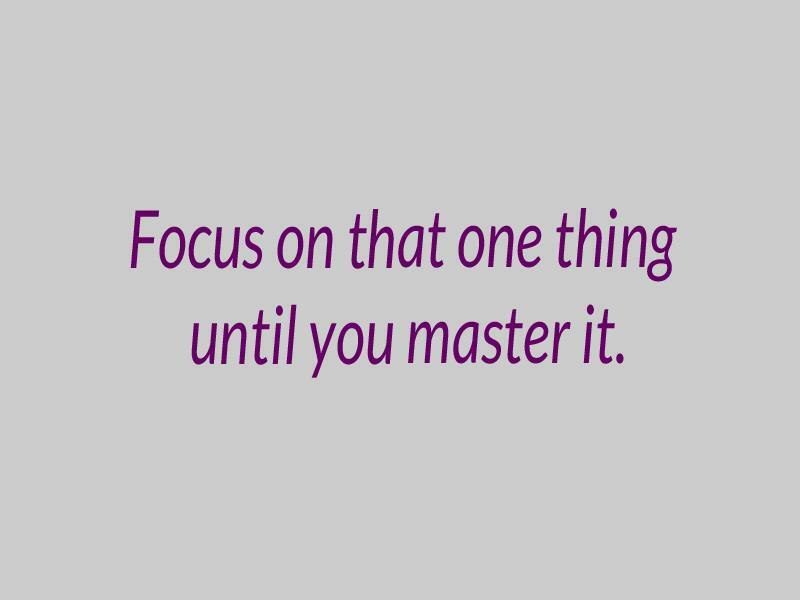 Focus on that one thing until you master it.